Within a span of four days in July, Owlin again proved its value at reporting time-sensitive financial information ahead of competitors. 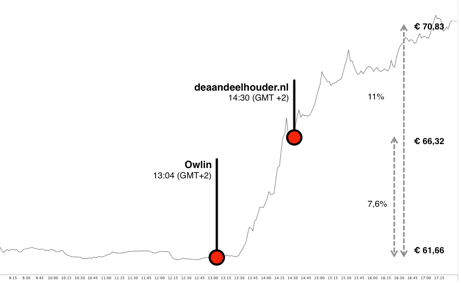 July 29: The Owlin newsroom catches the ASML stock as it rises 1h26m ahead of other Dutch news services. July 30: The Owlin newsroom highlights an article explaining the trading suspension of Corio seven hours before market opening. July 31: Owlin subscribers received a profit warning from Adidas a full hour before market opening. Other major wire services reported the news just minutes before the market opened, or even later.